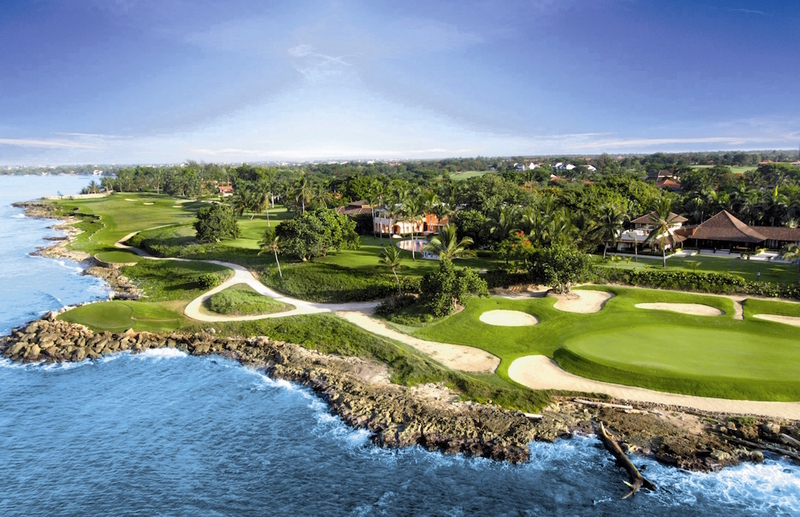 Built on land described by designer Pete Dye as the greatest piece of earth he’d ever seen, the Teeth of the Dog golf course is the showpiece of Casa de Campo, a 7,000-acre resort and housing estate built on the southern coral coast of the Dominican Republic. 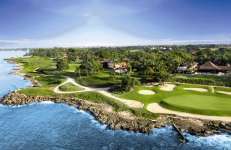 Opening in the early 1970’s Teeth of the Dog has become the Caribbean’s most popular golf destination, thanks largely to the long stretch of magnificent coastline it occupies and Dye’s three extraordinary short holes built right on the edge of the Caribbean Sea. Constructed entirely by hand using local laborers, building the course may have been an arduous process but Dye claims the design was relatively simple as ‘God made seven holes’ and he only had to come up with another eleven. Exposed to constant, variable winds and in many ways an archetypal modern resort course, the layout Dye devised does have a classic routing with holes set out in a clockwise and anti-clockwise loop on either side of a central clubhouse. The seven holes that occupy the prime coastal land grab most headlines, although inland there is a healthy smattering of strategic risk-reward options and some very interesting golf holes mostly defended by heavy-lipped bunkers flanking fast, slightly raised greens. Among the early holes the standout is the 2nd, a terrific driving test along a rocky wasteland with the green cleverly angled to favor those who can drive beside the hazard. The short 5th is the first of the ocean holes, its tiny target resting almost entirely within the sea and the wind either pushing you offshore or forcing you to start your ball over the waves. The next par three is the 7th, a cracking long shot played over the surf and in the same direction as the 5th, this time to a fine green ringed by impressive sand traps. Either side of this classic are brutal par fours that strangely favor those who drive away from the seawall but offer ample opportunity to rack up a large number, the 8th green being the most extreme on the course with several pin positions virtually inaccessible to all but the highest spinning professionals. The course then turns inland at the 9th, returning for a three-hole encore starting at the superb 15th. Like the 17th, this Cape style hole plays along the cliff edge with the ocean lurking on the right to catch anyone slicing away from the heavily treed left side. 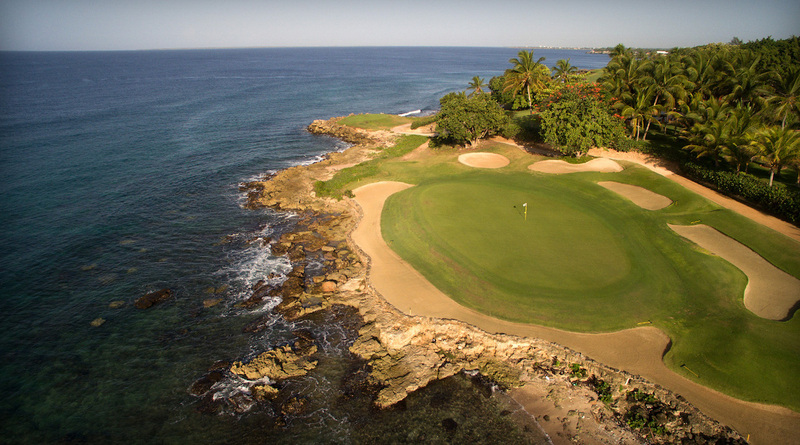 Sandwiched between these great par fours is the final par three, an exhilarating signature hole played across a rocky cove to a daunting green site that rests atop a ledge. The success of Teeth of the Dog helped to establish Pete Dye as North America’s premier golf course architect and he has remained heavily involved in its evolution, continually tweaking and stretching his famous layout. 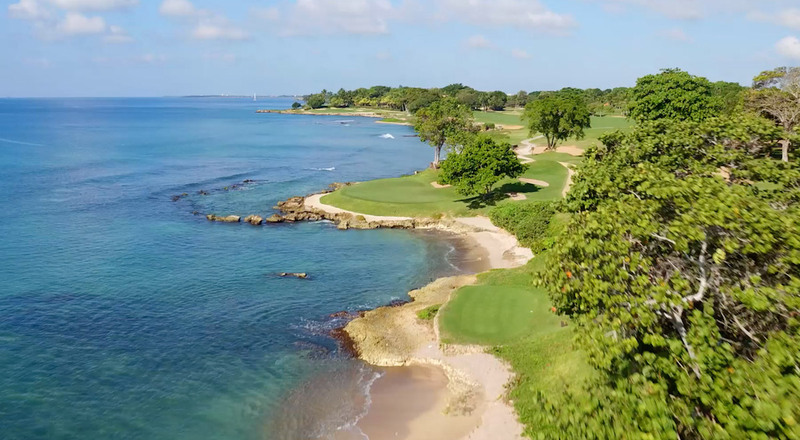 While the tiger tees, newer bunkers and more severe green contours have been added to increase the challenge for the modern golfer, several hurricanes and a rapidly expanding residential development have also had an affect on both the landscape and design. The exposed holes along the sea have felt Mother Nature’s fury the hardest and been cleared of much foliage over the years, while the huge sandy waste area between tee and green on the 7th had to be grassed and converted into a bank to protect houses and prevent erosion during severe storms. Dye himself has altered and re-contoured nearly all the holes at some point, the lengthening of the short par four 4th and the new bunker across the 18th fairway, built to prevent 300-yard bombs from the tee and to ensure a stiff close to the round, are most notable among the more recent changes. Although the course is highly recommended, several of the less exciting holes do feel a little underwhelming, this in part due to the illustrious company they keep but also because many lack visual interest from the tee and are only rescued by their tough green complexes. Aside from tricky targets there is little to recommend on holes such as 1, 3, 11 and 12 while the reachable 14th is a fairly ordinary lakeside par five. What saves ‘the Dog’, however, is the tremendous beauty of its setting and the all-world quality of the stunning coastal holes.